When a part is spraypainted, a mist of paint can float down onto other surfaces. This can happen when a part of a car is being painted. This mist falls down onto other parts and dries up. 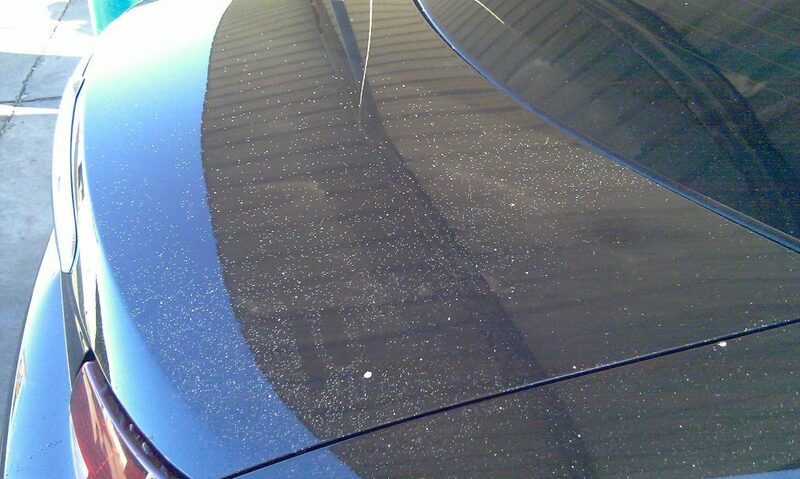 This is called overspray and shows up as very small specks on top of the paintwork. Bodypanels on vehicles are generally painted with paint that is sprayed over the surface. The paint is forced through a nozzle that turns the liquid into very small drops that are spread over the surface while spraying. The paint dries up and leaves a solid layer of paint on the bodypanel. This mist of paint is very light, and can easily be carried by wind. This tiny paint particles can float onto surfaces that aren’t supposed to get painted. These tiny drops dry up and harden. This results in very small specks of “dust” on the paintwork that is very difficult to remove. These specks feel hard. There are a few different solutions to removing overspray, it depends on how much overspray there is, how hard it has become and/or how big the blobs are. A regular claybar can pull the specks of paint loose from the surface, and remove them. This might not go easy, and could require some effort and pressure. But should work on most cases. If a claybar isn’t rough enough, it might need a more rough approach. Wetsanding will literally sand down the specks of paint, but might also result in sanding down a small part of the original paint. When filling in chipped off paint, there might be a small blob of paint. This can be taken off by a de-nibbler. This tool can also be used to “nibble” off overspray. However, this will take much more time. Plastic razors look like razor blades, but are made of a hard type of plastic. This plastic might be strong and hard enough to push the overspray off the surface, but it won’t be hard enough to make a scratch in the paintwork. Mineral spirits or vaseline can loosen up the paint specks, making them easy enough to remove. However, this often works best on relatively fresh overspray. After soaking, it should be much easier to remove by clay, or even a MF towel. Certain techniques should be avoided, because of the increased risk of causing damage. Razorblades or glass-scrapers can easily damage or scratch the paintwork underneath the overspray. Because you might need pressure on some specks, there is a risk of loosing control and make a long and/or deep scratch. Polish might be able to remove the specks of overspray, but because of the turning motion, it will result in those specks being dragged over the paintwork. Potentially making many deep and long surface imperfections.